In a world shrunk by modern transport and communication, Star Trek has maintained the values of western maritime exploration through the discovery of ‘strange new worlds’ in space. Throughout its fifty-year history, the ‘starry sea’ has provided a familiar backdrop to an ongoing interrogation of what it means to be human. This book charts the developing Star Trek story from the 1960s through to the present day. Although the core values and progressive politics of the series’ earliest episodes have remained at the heart of Star Trek throughout half a century, in other ways the story it tells has shifted with the times. While The Original Series and The Next Generation showed a faith in science and rationalism, and in a benign liberal leadership, with Deep Space Nine and Voyager that ‘modern’ order began to decline, as religion, mental illness and fragmented identities took hold. 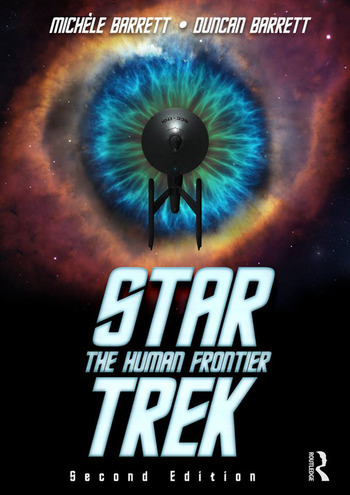 Now fully revised and updated to include the prequel series Enterprise and the current reboot film series, this new second edition of Star Trek: The Human Frontier – published to coincide with Star Trek’s golden jubilee celebrations – addresses these issues in a range of cultural contexts, and draws together an unusual combination of expertise. Written to appeal to both the true Trekker and those who don’t know Star Trek from Star Wars, the book explores and explains the ideas and ideals behind a remarkable cultural phenomenon. Michèle Barrett is Professor of Modern Literacy and Cultural Theory at Queen Mary University of London. Her books include Casualty Figures, The Politics of Truth, Imagination in Theory and the feminist classic Women’s Oppression Today. Duncan Barrett is an internationally bestselling author of historical narrative nonfiction. His books include Men of Letters, The Sugar Girls, GI Brides and The Girls Who Went to War.